Oupa used to be called Yu(c)k, the side project of Yuck frontman Daniel Blumberg, formerly of Cajun Dance Party. I assume you got all of that. Blumberg's changed the name of his solo project and has also seemingly changed a lot since I saw him gallivanting around like a mad hatter during our collective secondary school days. Oupa delivers hauntingly melancholic ballads with a serenity that belies Blumberg's past. Maturity, it seems, comes at the cost of exuberance. It's hard to judge Yuck and Oupa side by side but I think I may well prefer the tender longing of the latter over the 90s American indie rock aspirations of the former. The timing of Oupa's emergence is perhaps a little strange, coming just a couple of weeks after the release of the debut Yuck LP, and pretty much the same time as the band's new video. I guess sometimes it's hard to contain one's musical excitement so fair enough. 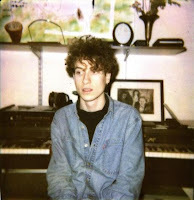 The new Oupa track 'Forget' (downloadable from the Yuck blog) has been taking most of the plaudits but for me, it's all about the weary beauty of 'Daughter'. That track opened last year's 'Weakend' EP, which can be streamed in full on Soundcloud. A 7 track release from Oupa will be released in June. Keep up to date at oupamusic.com.